Explore the seldom-seen continent of Antarctica aboard Silversea Expedition's luxurious vessel, Silver Explorer, as she navigates through an array of spectacular natural wonders from sculpted icebergs and calving glaciers to native wildlife on a 10-day roundtrip voyage from Ushuaia, Argentina. Departing on 12 December 2015, Silver Explorer cruises through the legendary Drake Passage before continuing her breathtaking adventure through the Antarctic Peninsula, where guests can expect to be in awe of the natural beauty. Guests can watch as seabirds glide through the air currents, seals sunbathe on slow-moving ice floes and humpback and orca whales breach the surface. With Silversea Expeditions all shore and Zodiac excursions are included enabling guests to step ashore Antarctica's vast white wilderness, walk amongst a variety of penguin rookeries and perhaps visit scientific research stations. All of these activities are guided by an expert expedition team of naturalists, ecologists and biologists. If weather conditions permit, itineraries comprise of a number of Antarctic islands including: Aitcho Island, home to Gentoo and Chinstrap penguins; Paradise Island, renowned for its stunning scenery and Petermann Island, a geological masterpiece. 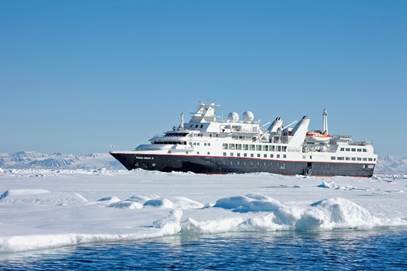 Silver Explorer then returns to Ushuaia with guests disembarking 22 December 2015. Prices are per person starting from AU$15,110 in a View Suite based on double occupancy. Silversea Expeditions' fares include: all shore and Zodiac excursions hosted by an expedition leader; all-suite accommodation with butler service; gourmet meals with menus inspired by Relais & Châteaux; complimentary wines, Champagne and spirits served throughout the ship; an outstanding expedition team of expert guides and lecturers; and all gratuities.